When a worker suffers an accident at work it can have far reaching consequences, particularly for family members. At Thompsons, we are committed to seeking justice for victims and their families. Personal injury compensation is an important part of this as it helps to lessen financial worries and provides the security of a financial safety net. Workplace accidents vary in severity; from minor trips and slips, which may cause a sprained ankle or damaged ligaments in a wrist, to catastrophic accidents such as a fall from height which may cause life-changing injuries. Either way, if your family member has been injured due to a lack of care by their employer they are legally entitled to make a claim for compensation. Some people, especially those with minor injuries, may not want to make a claim, particularly if they plan to continue working for their employer. So, they may take some time off work, often on statutory sick pay (SSP), and go back to work after 28 weeks, even if they are not fully recovered from their workplace accident. Some people go back to work earlier than they should because SSP is far below their full wage. This should never happen. At Thompsons we can help accident victims by ensuring their rights. This means that your accident claim will take into account the full time you need for your injuries to heal properly and the compensation amount will reflect your full pay including any lost overtime and bonuses. Plus, if you need rehabilitation in the form of treatment or physiotherapy, your compensation award will provide for this and you may be able to seek treatment privately so you won't need to go onto NHS waiting lists. Employees who have suffered an accident at work sometimes fear reprisals and perhaps even the loss of their job if they speak up in order to make a claim. At Thompsons we understand this concern, but can reassure you that you are protected by law and that we will work to ensure your continuing employment rights are protected. Following illness or injury it is your right to keep your job, and it is your employer's responsibility to ensure that you are accommodated should your injury prevent you from performing your pre-accident workload. In certain cases, a personal injury award can include retraining costs, so that you can learn new skills to enable you to work in a different capacity following your accident. Of course, you may not want to or be able to return to your old job. Thompsons will be on hand to advise you of how you can move forward in a new or modified capacity and advise on providing modifications for work equipment as well as your retraining options. Our work accident solicitors take all these factors and more into consideration when arguing your case. If the accident victim is able, i.e. has full mental capacity and is physically able, he or she will need to make the claim on their own behalf. However, friends and family can assist the claimant in lots of practical ways, such as helping to gather evidence from work colleagues and accompanying the claimant to meetings etc. If the case goes to court and the claimant is not fit enough to attend, a doctor's certificate will be required. In cases where a family member has died following an accident at work, a dependent can make a claim. The claim must be brought within three years of the death or within three years of the date that the cause was identified. Our serious and fatal injury claim section has lots more information on such circumstances. The time following a fatal accident at work is extremely traumatic for the family, and Thompsons is committed to carrying out the claim as sensitively as possible while ensuring the family's rights are upheld. When someone dies as a result of going to work, the shock, loss and injustice can be overwhelming, but we are determined to be at your side to help you through the legalities of making a claim on behalf of your loved one. Claiming compensation is not about making a fuss! We sometimes hear family members say that their loved one "doesn't want to make a fuss" about their accident. However, we all have the legal right to seek justice and, in many cases the benefits of making a claim are more than just financial. For those who need it, a claim with us can provide access to treatments, rehabilitation therapies and retraining, as well as protection from the costs of these things. And, in many work accident cases, the employer will have to put right the cause of the accident, so by making a claim your loved one can help prevent a similar incident from happening to another worker. As one of Scotland's leading teams of work accident claim solicitors, Thompsons is dedicated to helping claimants get the most comprehensive package of compensation in the shortest time possible. You can read about some of our successful work accident claims here. We pride ourselves on always working for individuals (the claimants) and never for businesses and insurance companies (the defendants). 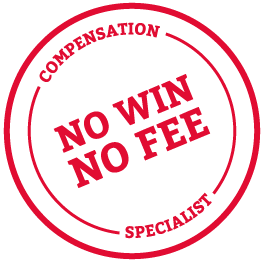 We campaign for the rights of workers in Scotland and pride ourselves on providing access to justice by offering a No Win No Fee package that protects claimants from legal fees should they lose their case. You can talk to us today about your loved one's circumstances by calling 0800 0891 331, so that we can help you help them understand the benefits of making a claim.